L'Estartit is popular holiday town just beyond Torroella de Montgri under the hills of Montgri and the main access point to the Isles Medes, reputatedly one of the best diving and sub-aqua areas on the Mediterranean. L'Estartit itself has a large port and older fishing area linked to the old town with shops and restuarants, and next to the port a long and very broad beach backed by modern hotels and apartments. 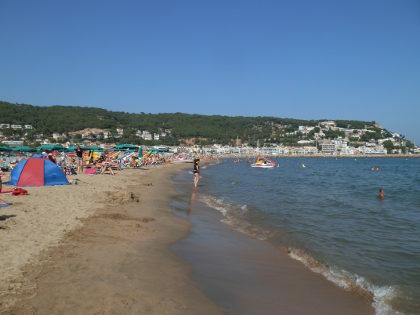 The area is popular with the British both for camping and package holidays particularly for families, and has a handful of British bars - something that is now quite rare in the mid and north parts of the Costa Brava. The beach itself stretches from the port wall all the way along to Gola de Ter (about 4-5km) and then down to Platja de Pals with sunbathers spread along to the limits of the town - but with enough space that it doesn't feel crowded. At the main L'Estartit end the beach is very broad - 60-70 metres wide with enough space for parking at the back of the beach. The sand is fine and soft, perfect for sand castles or beach sports, and the bay shelves gently out to sea making this an excellent beach for small children. The shallow water also means that the water is warmer at the earlier and later parts of the season - there is no problem swimming in September. The bay itself is all sand with a sand bank about 30m out shallow enough for standing when we were there (sand banks move so this may change), however the sandy bottom means there are relatively few fish visible. Swimmers who like to explore will find the swimming a little dull, though it is easily possible to swim long distances. As would be expected the beach is monitored by lifeguards. Pedalos, canoes and other water craft can be hired as can loungers and umbrellas. Showers can be found at the back of the beach by the car park. There are three or four chiringuitos or beach bars on the beach itself, but not so much on the street directly behind which is mainly hotels and apartments. The main town centre is a little way away from the beach behind the port and in among the streets of the hotel/apartment blocks. The sand is excellent - fine and slightly powdery sand all along the main beach with no stones or grit. This is really a family orientated beach. The bay shelves gently into the water (it's at its gentlest closest to the port wall) deepens and then has a sand bar some 20-30 metres out from the shore which is shallow enough to stand on. The bay has a sandy bottom and though there are fish (and the occasional reedy weed) it is not particularly interesting for snorkelling. However, for snorkelling and seeing fish there are boat trips to the Isles Medes. Parking is easy at the back of the beach, or in the back streets of the town all of which are free parking. Closer to the old heart of L'Estartit there are fewer spaces so parking closer to or on the beach is generally the easiest option. The beach stretch can be walked down to the Gola de Ter where natural Aiguamolls (sea marshes) can be found behind the beach.